Swimming backstroke poses a few challenges for breathing. You have to keep your face above water to breathe, and splashing water can be a problem. But these difficulties can be overcome. This article explains how. Breathing in backstroke poses a few challenges. To keep your face above the water surface, you need good balance. This means you know how to position your body, so it stays horizontal in the water. This is more difficult in backstroke than in front crawl because you need to balance while floating on your back. Once you have mastered good balance, breathing becomes easy because your face stays above water and there is no risk of inhaling water. On the other hand, without balance, your face will sink beneath the surface sooner or later, and breathing will be disrupted. You need an at least moderately effective flutter kick to keep your legs up and provide propulsion. In the beginning, if your kick is ineffective, you can use swimming fins as a helper. You need to learn how to lean on your upper back to attain a horizontal position. This helps to keep your hips and legs up. Head-lead supine balance is an excellent swimming drill to practice this technique. While practicing balance or swimming backstroke, a nose clip can help prevent getting water into your nose. You then only need to focus on your mouth. Later one you will be able to get rid of the nose clip once your technique has improved. 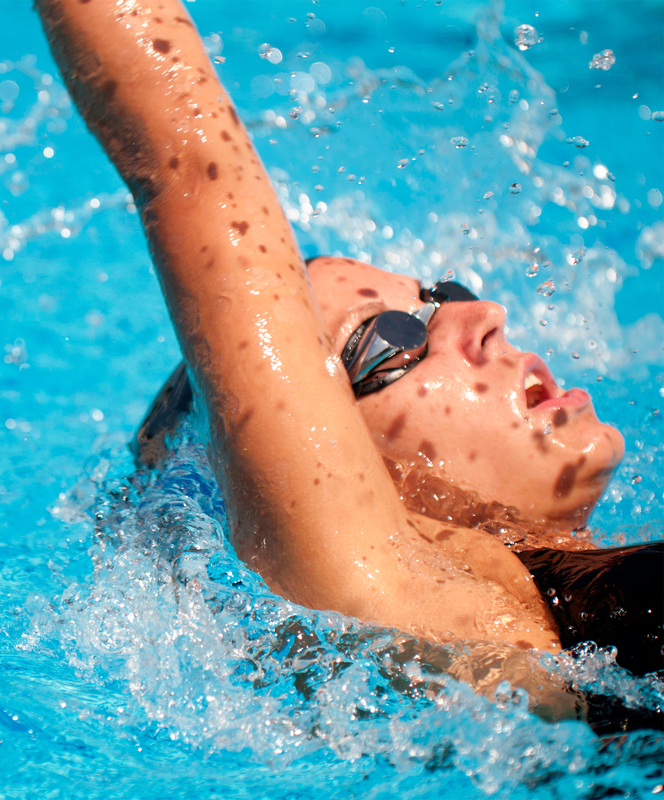 Water splashing in your face during the arm recovery is another issue that can disrupt your breathing. To avoid this, exhale at the moment when water is projected in your face during the arm recovery. It takes some practice, but over time it becomes second nature. Inhaling quickly through the mouth and nose, then exhaling slowly through the nose only while keeping the mouth shut also helps to keep water out. That’s because water can’t get into the nose as long as you are exhaling and your mouth is closed. While swimming backstroke, a breathing pattern you can use is to inhale during the recovery of one arm, then to exhale during the recovery of the other arm. This breathing pattern is simple and efficient. Another breathing pattern you can use is to breathe every arm stroke. To do so, for each arm, inhale quickly at the beginning of the arm recovery, then exhale slowly for the rest of the arm recovery. This avoids the problem mentioned above of water getting projected into your face and disrupting your breathing.